The use of humor in anime can either be a hit or miss. For most of us, our introduction to the world of anime was through large fight sequences, flying robots, and small, battling animals. Therefore, we expect more action out of our anime than we do humor. And when humor does arise in anime, it can often times be overblown to the point that it is no longer funny. The setup can be funny, but the punchline can land flat and then we’re left more straight-faced than Saitama from One-Punch Man. But, speaking of One-Punch Man, there are some anime that get the humor right. Shou Futamata’s Nanbaka — The Numbers is the latest anime to land on its humor and to provide the audience with a steady string of laughs that is not found in the other anime in this season. 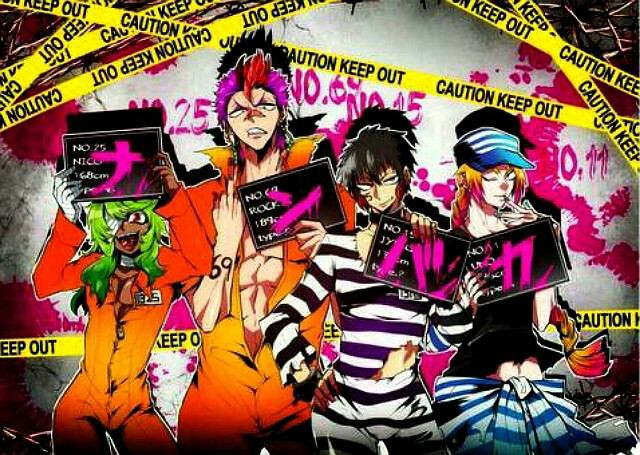 Nanbaka is a 2013 manga written and illustrated by Shou Futamata. It debuted on the Comico manga app and was published in print by Futabasha. Nanbaka is an action comedy manga/anime. Other notable action comedy manga/anime are Lupin the Third, Assassination Classroom, and aforementioned One-Punch Man. The story is about four young men, Jugo, Niko, Rock, and Uno, who have broken out every single prison they are placed into. The four men are then sent to Nanba, the most formidable prison in the world. The four constantly attempt to escape the prison and are always captured and placed back into their cells. What makes Nanbaka funny is the importance that it places on its characters to tell the story. Where other anime fall short is that they can often rely too heavily on situational humor to create laughs, instead of letting characters act out their humor. Take One-Punch Man, for example. Saitama is placed in funny situations, but that is not what makes the show funny. Saitama, as a whole, is simply a funny character and his temperament is the same throughout (except when he gets angry). Nanbaka takes the same approach. The personalities of the characters formulate the show and they remain the same throughout, creating funny moments for themselves. The warden is tough on the surface but is in love with one of her prison guards. In a funny scene in the third episode, she catches a drop of sweat from his face and feigns over the newly acquired memento. In the same episode, the four are introduced to a ninja, and Niko, Rock, and Uno fangirl over the ninja because the only time they have seen a ninja in real life was on TV. As they scream out “Ninja!”, a soft “wow” is heard underneath the scene that makes you have to laugh. But, this is all serves as the contrast to Jugo, who seems like the most dynamic character on the show. Although the show focuses on four characters, Jugo is the obvious focal point as he is the most gifted and serious of his three friends. This mystery is what makes the show intriguing to watch because you want to find out more about this one character, who remains serious despite the large amount of humor around him. The humor will keep us entertained, but the mystery behind the show is what will keep us coming back for more. What makes the show good, however, is that it places the humor first. Within the first three episodes, there is actually no real action or fight sequences despite the program being an action comedy. Therefore, if you are unable to take the humor, then you will be unable to enjoy the action that will surely come. Nanbaka is definitely worth the watch and should be added to your list of anime.